I didn't expect you to bite back that quick. Nice score! That is the highest score I've ever got on MAME. 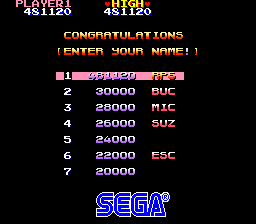 Managed 600k in the arcade in 1990, but have forgotten where lots of dolls and letters are. One of my favour games ever. Do it! It is all about keeping your lives. Once you have the mushroom and are getting 10k a milk bottle (keep the skateboard) your point fly. Great score ! Congratulations !